Riverbed recently acquired some new technologies that offered attractive benefits to IT professionals with data-center and systems infrastructure responsibilities. And so suddenly the Riverbed marketing team found itself needing to build up its ability to market to this new market segment. Traditionally strong in the network silo, they wanted to quickly spin-up a database of contacts they could use to address the data center. This is where Xactlyit came in. We recommended and launched a program that included use of our prospect database, plus development of a solutions-appropriate email, built to generate opens and clicks among data center professionals. We orchestrated a series of 3 blasts, and were able to deliver in the area of 15,000 new contacts to Riverbed — including email, telephone, and mailing address data — based on the click and open responses. We were able to contribute over 150,000 contacts to the starting prospect-pool from our proprietary technology database. Each of these contacts were IT data center executives that fit Riverbed’s criteria. Exposing an appropriately segmented target database, like this, to relevant messaging via email, elicits responses from those who a) have an interest in the topic, and b) are real-live contacts as validated by virtue of their response. 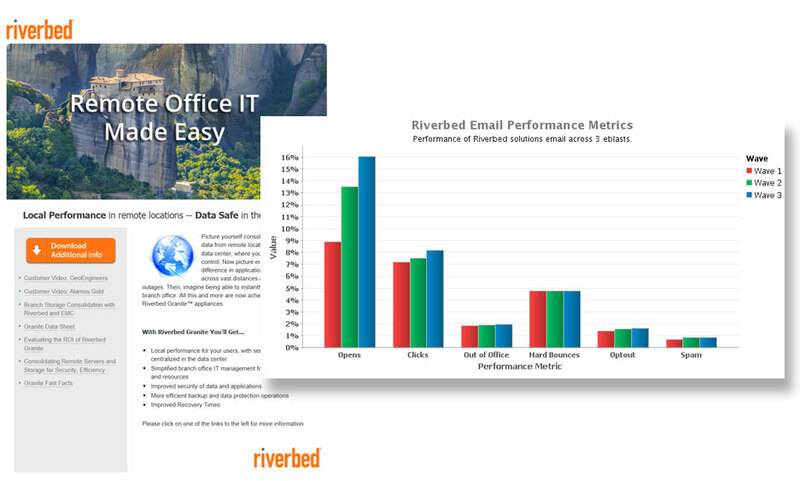 These email respondents became the high-value deliverables made available to Riverbed to build up their marketing database. Working with Riverbed’s branding guidelines, Xactlyit developed the messaging that was used in the email. Particular attention was paid to understanding the interests of the segmented target audience, grabbing their interest, and in presenting “clickable” assets that would be relevant and appealing. Further, crafting the email subject line effectively, so the “opens” were optimized, both for volume and for relevance to Riverbed’s solution, was another important element of the campaign. Xactlyit designers understand email. While our design adhered to Riverbed’s branding guidelines, we reviewed all designs for impact and response. Plus we ran a pre-launch test of the design in all the major email clients to optimize delivery to the user. You’ll note from the metrics in the main graphic that our bounce rates and spam exclusions, were exceedingly low. This is a credit to both our database and the email composition. In the IT space, when blasting promotional-type emails, organizations can expect anywhere from a 10% to 20% net open rate after three blasts of the email. You can also expect a 2% to 5% net click-through rate. The Riverbed campaign hit the center of the expected open rate range (at 16%) and over-achieved on the click-through rate (at 8%). Xactlyit was able to deliver nearly 2,000 click-through contacts to Riverbed, plus another 13,000 + contact records who opened the email, giving Riverbed a great head-start on their marketing campaigns aimed at data center personnel.